What a fab day today at Hugglets Bear Fest in Kensington, meeting lots of teddy bear people, both collectors and makers. Teddy bears left, right an center! Teddy bear people are a great bunch. I have been to Hugglets a few times, years ago when I had Bearsac. A few people there today remember meeting Bearsac and were sad to hear of his bearnapping six years ago. 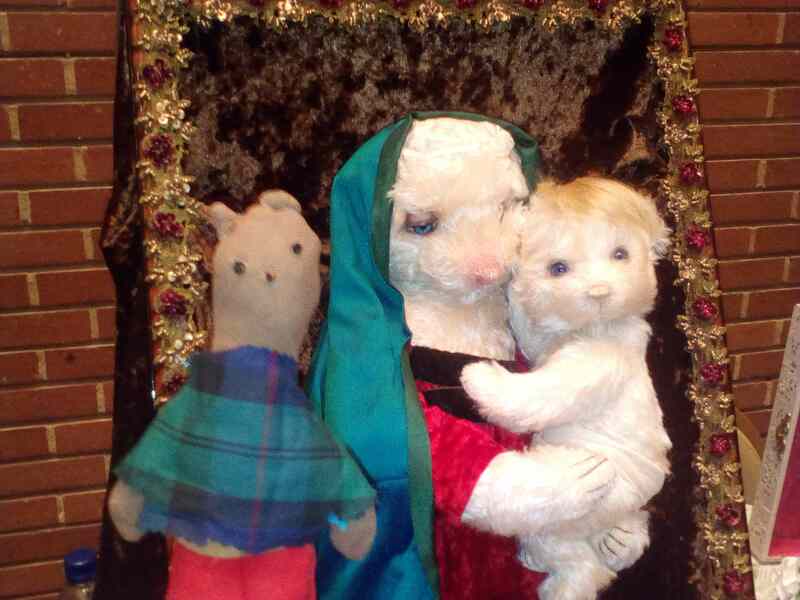 In attendance was cute little, Mini-Bearsac (in the photo above with Mary and baby Jesus)! If the makers of Mary and Jesus see this and want me to put a link here to their website, then let me know. I didn’t think to take a card or to ask you. To all the people I met today, I like to wish you all the best in your projects and life in general. For anyone interested in Huggelets Bear Fest (where teddy bears and teddy bear paraphernalia are sold) see http://hugglets.com/ There are two a year in London.